Q. What are some highlights of the Papal Visit to the United States in 2008? A. Certainly one of the major highlights was Pope Benedict’s meeting with four victims of sexual abuse by clergy. It was historic, and, by all accounts of those present, very emotional. It showed that the Holy Father is deeply troubled not only by the stain that the abuse by clergy has been to the priesthood but also by the incredible pain it has caused in so many lives. Q. You describe the Pope’s reception by Americans as akin to a “family reunion.” How so? A. The word pope comes from an Old English word that means “papa.” For Catholics, he’s our spiritual father. Q. How did an introvert, not to mention octogenarian, like Pope Benedict, become the first Pope to make an appearance on YouTube? A. Perhaps he just happened to be in the right place at the right time. YouTube only came into existence in 2005, the same year that he was elected to the papacy. However, we must give him credit for being willing to move so quickly—especially for the Church—into this new medium. Q. How has Pope Benedict embraced new technology and social media as an evangelistic tool? 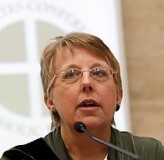 Helen Osman is secretary of communications for the USCCB.